wealth & trade | The Humble "I"
Zakat: Helping the Needy at Home or Just Abroad? Thoughts that first cross the mind when it is suggested that zakat should be given at home in the UK, as well as abroad, is: foolish; nonsensical; totally irresponsible; utter ignorance; unIslamic, even! After all, who in Britain is truly poor or needy compared to, say, the millions of people in Malawi, Liberia, the Democratic Republic of Congo, Afghanistan, Syria, Iraq and other parts of the poverty-stricken or war-torn world? The “spending (infaq) out of what God has given” in the above verse comprises two forms of giving. One is sadaqah – voluntary spending; the other, zakat – the spending of which is mandatory. The term sadaqah (usually translated as “alms” or as “charity”) covers, not just the giving of money to the deserving poor, but also the giving of one’s self, talents, learning, or simply one’s time. The act is seen as meritorious in and of itself, purely on altruistic grounds. Yet the spiritual significance of sadaqah can’t be overlooked too. Giving regular sadaqah attracts madad – the flow of divine assistance, as well as helps repel misfortune. Based on the words: “to be taken from their rich and given to their poor,” jurists from the four Sunni schools of law, or madhhabs, say that zakat, as a rule of thumb, is to be distributed locally where possible. In short: what this tells us is that the poor and needy of a city have greater claim over local zakat than the poor or needy elsewhere – accepting that scholars permit sending it abroad for pressing reasons. “There are no poor Muslims in Britain,” is a common response to the suggestion that zakat could be disbursed here, within the country. But is this true? No poor Muslims? Even if it were, what of the other categories of zakat recipients? Are they absent from Britain too? The reality is markedly different from the popular Muslim perception. For there are a growing number of poor and needy Muslim households in the UK who would qualify for zakat. It is true that their need is likely to not be as acute as those in certain other poverty-ravished places in the world. Nevertheless, their relative poverty, in terms of not having enough money for certain basic necessities – like food, heating, medicines, or paying rent – would entitle them to zakat. Of course, if government benefits meet such needs, well that is different. But if they did not, and sometimes they don’t, then scholars have ruled that they would indeed qualify for zakat. Those who could enter into the category of the poor (fuqara) and the needy (masakin) are: struggling single parent families, asylum seekers, refugees, and anyone else whose net assets (after one excludes assets for basic essentials like a house, car, furniture, etc; and after deducting basic living expenses and debts owed) are less than the nisab value.11 This could also include prisoners; and even more so, families of prisoners, who often have very little or no financial support. Then there are the mu’allafat al-qulub – “those whose hearts need reconciling.” These recipients can include: recent converts to Islam who are alienated from their families, or whose faith needs strengthening; or recently released prisoners struggling to make ends meet and about whom it is feared will reoffend. There is also the category of the gharimun: “those burdened with debts” contracted in good faith, which they subsequently cannot repay. Of course, we’re not talking about those who’ve racked up debts due to conspicuous consumption, spending and living beyond their means, or through gambling and other haram indulgences. Instead, we are talking about people who, for instance, and through no fault or irresponsibility of their own, have fallen into rents arrears and are on the verge of eviction. Or, where a family whose bread winner has been made redundant, and find themselves in arrears with domestic utility bills, to the extent where the gas or electricity supply is going to be cut-off. As for the category of fi sabili’Llah – “for the path of God” – here in Britain this would include financial assistance to students fully occupied in formally studying the sacred shari‘ah sciences. Classically, of course, the fiqh manuals depict this category as being primarily voluntary fighters (mujahidun), not paid by the state treasury, who require financial support so as to partake in a bonafide state-sanctioned war against a hostile and belligerent enemy. In the above, I’ve tried to spotlight people who could very well be entitled to receive zakat in Britain, but who often get ignored, or go unnoticed and unserved. As for the more higher profile categories: orphans; widows; the starving, hungry and homeless; Muslims incarcerated in prisons such as Guantanamo, with no sure evidence against them and no access to justice or the due process of the law; and the countless victims of natural disasters across the globe – we must indeed continue to reach out to them with our zakat (and our sadaqah and du‘as). Subhana’Llah! Their plight often beggars belief and the sheer scales of the tragedies are so grotesque; and living for the poor is the undeniable Sunnah, often forgotten by us Muslims today. Having a social conscience with respect to Britain’s needy and vulnerable Muslims is in no way to ignore the poverty, starvation and persecution which afflicts millions of Muslims in other parts of the globe. British Muslims will have to learn to discharge their duties to both, in light of the priorities set by Islam’s Sacred Law. It’s even been argued that, if we were to get our own house in a little more order, it would help us to better help others in the long run. Whatever the case, we need to think the issue of how best to deploy our zakat; of how best to help restore dignity to the needy and the impoverished. This, then, is the case for not neglecting to give zakat to the growing number of poor and needy Muslims in Britain today. 1. Ibn Kathir, Tafsir Qur’an al-‘Adhim (Beirut: Dar al-Ma‘rifah, 1987), 1:45. 2. Jami‘ al-‘Ulum wa’l-Hikam (Beirut: Mu’assasah al-Risalah, 1998), 1:454. 3. As per al-Raghib al-Asbahani, Mufradat Alfaz al-Qur’an (Damascus: Dar al-Qalam, 2002), 380-81. 4. Hujjatu’Llah al-Balighah (Beirut: Dar al-Kutub al-‘Ilmiyyah, 2001), 2:69-70. 5. The fiqh details that make a person liable for paying zakat, and to whom and how such monies should be disbursed, are issues for which the lay people must consult a qualified scholar. 7. Al-Hajjawi, Zad al-Mustaqni‘ (Riyadh: Madar al-Watn li’l-Nashr, 2004), 78. 8. Ibn Naqib, ‘Umdat al-Salik (Qatar:Nafaqah al-Sh’un al-Diniyyah, 1982), 111. 9. Cited in al-Bassam, Tawdih al-Ahkam min Bulugh al-Maram (Makkah: Maktabah al-Nahdah al-Hadithah, 1994), 3:27. 10. Al-Zayla‘i, Nasab al-Rayah (Beirut: Dar al-Kutub al-‘Ilmiyyah, 2002), 2:423. 11. Nisab: This is the minimum amount of wealth upon which zakat becomes payable. If one only has gold assets, the nisab is 87.48 grams of gold. If the assets are a mixture of gold and silver, the nisab for silver is utilised, which is 612.36 grams. In monetary terms, one converts these nisab levels to the current market prices for gold or silver. Thus, at today’s price (8/2/2015), the market value for gold, per gram, was £26.02; and for silver, £0.35. So whoever has £2,276.23 or more of net gold assets, will have to pay zakat, or £214.32 of mixed net assets must pay zakat. Those possessing less than the nisab are not liable for zakat and are usually considered poor or needy. One, however, consults a qualified scholars if unsure about how to calculate zakat. Can You Find Spirituality in the Shopping Mall? 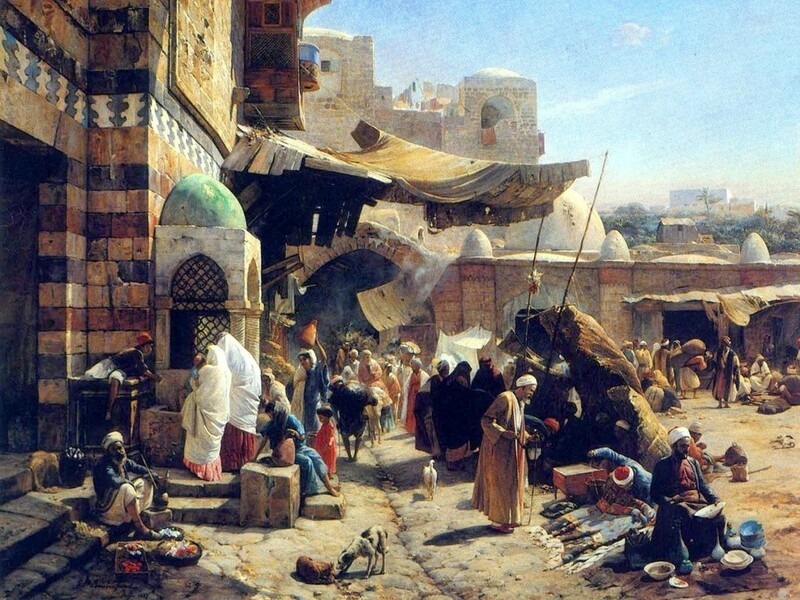 In our second visit to the discourses of the saintly shaykh, ‘Abd al-Qadir al-Jilani (the first outing may be read here), we find him discussing the issue of going to the market place – or in our time, the shopping mall. Of course, markets being despised has nothing to do with trade or commerce, per se. It does have to do with the fraud and deception common in such places, as well as the greed, avarice, bickering and disputations. There, false oaths are frequently sworn and honest remembrance of God usually conspicuous by its absence. More than that, the market is where even a renunciant’s heart can easily be entangled in the tentacles of dunya, or be ensnared by its false glitz and glitter. Enter it for needs, we must; enter it for wants, we may. But enter it bewitched or besotted, we must not! Another type is he who acquires such goods and uses them and procures them by the grace and blessings of God as part of his worldly lot and wealth; giving thanks to God for them. Then there is one who does not see or notice them at all. He is oblivious to everything other than God; Mighty and Majestic is He. Thus he sees no other, is deaf to all but Him; he is too preoccupied to see anything but his Beloved and the One he yearns for. So he is quite detached from what the world is all about. If you chanced upon such a person entering the market place, and ask him what he sees in it, he will reply: “I don’t see anything.” Of course he does see things, but with the physical eye, not the eye of the heart; a casual glance, not a lustful one; a formal look, not a meaningful one; a look that is superficial, not penetrating. So outwardly he surveys the market’s goods and wares, yet all the while his heart beholds his Lord: sometimes His majesty, at other times His beauty. 1. Futuh al-Ghayb (Cairo: Dar al-Mukatam, 2007), 135-6.